LeagueJam makes it easy to manage every aspect of your league's website so you can pay attention to everything else, like running your league. It's Free! See what all the fuss is about. 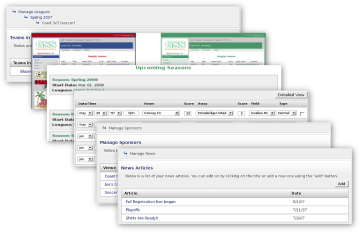 Find out how to start making your league website the easiest thing on your list. Start by taking the tour now. LeagueJam was designed by league organizers for league organizers and we are always looking for ways to improve our system and love to hear your suggestions... A few things we're working on include a scheduling wizard, custom playoff templates, and tournament style leagues. See our progress.